Are you a rather free spirited gal? Have people described your personality as cheery or sunny? Do you think you’re ready to saddle up and hit the old dusty trail as one of Woody's closest friends? Well then find your grit and grab this Adult Toy Story Jessie Costume. It will look like you just rode into the party on good ole Bullseye and you’re ready to get things started with some awesome yodeling. After all you will be Jessie the Yodeling Cowgirl! Toss on this exciting costume and you’ll transform into the lovable character that became everybody’s favorite addition to Andy’s toy collection in Toy Story 2! 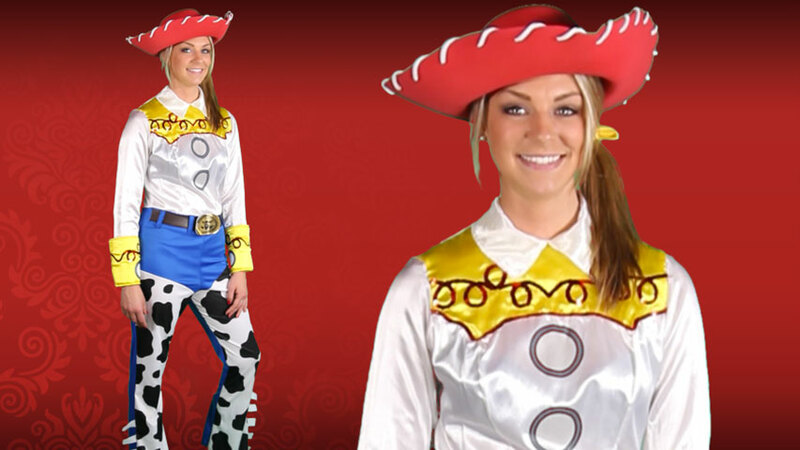 This western styled outfit comes with all the bells and whistles. It has an easy to slip on jumpsuit that is designed to look exactly like the outfit that Jessie wore herself! It has her classic black and white cow print chaps over jeans and her cute formal shirt with red and yellow accents. So you could really say this one-piece has it all! This awesome jumpsuit even comes with an awesome belt worthy of a cowpoke. To top off your new look, braid your hair and style it with the cute yellow bow. Then toss on Jessie’s classic red cowgirl hat. It even has the white overcast stitching! It is truly the finishing touch that brings the iconic look to life. Grab that special someone in your life and have him or her dress up as Jessie’s love interest, everybody’s favorite Space Ranger, Buzz Lightyear. Then the two of you can blast off into infinity and beyond! 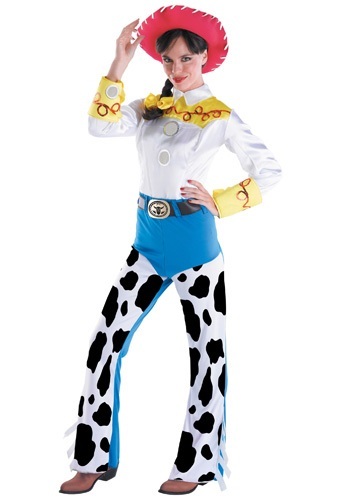 Of course, you could also get a whole group together for a Toy Story-themed Halloween this year. Either way you’ll be in for quite the adventure!